Don't you ever have the urge to just make something - anything? Just as long as you can get your hands working on something? Beautiful. Love the mix of print and thread. Your linoprints alone are beautiful with all these tiny details ... but this extra spot of colour makes it even more adorable. Your mix of fabric, print and thread really is excellent. The little spots of bright color are lovely on the neutral toned fabric. Keep up the lovely work! sounds like everyday for me! 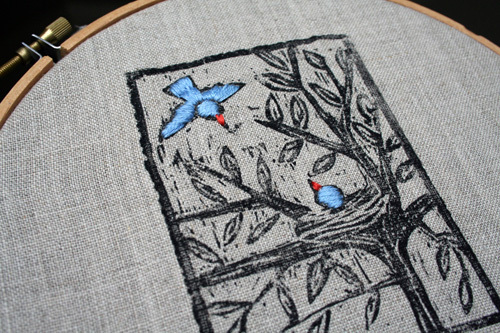 That is inspiring, I love the contrast of the blue birds to the black print, fantastic! It´s beautiful, would look lovely in the middle of a log cabin cushion. I love this! The vivid blue really sings and the block print effect is very appealing to me.